The NASDAQ-listed online travel agency MakeMyTrip's newly launched loyalty programme MyTrip Rewards can be accessed by invitation-only. Rival online travel agency Yatra's Elite Rewards, launched in June, is also for its top-end customers. They are following the trend set by global travel major Expedia which has a well-established, invitation-only programme called Elite Plus. And even as coupons and deals are being offered across e-commerce portals, whether in the travel category or retail, to snag new users, loyalty programmes are being used to attract and retain, with benefits that go beyond travel. Yatra Miles Program was launched in 2008 and all users of Yatra.com are automatically enrolled onto it. Hence, it has some 1.8 million members who use it to collect miles on every transaction. In June, the company invested in a 50-member dedicated customer relationship management team and launched Yatra Elite Rewards. Yatra's Head Marketing & Strategic Relations Pratik Mazumder said, "We looked at our trends and analytics of customer services and decided to set up a separate segment within Yatra Miles for our top-end customers." "A rising demand for premium loyalty programs has been observed from customer feedback," said the MMT spokesperson. "Programs such as these reward loyal customers and are a way of thanking them for patronising our services." 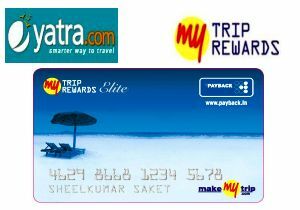 MakeMyTrip (MMT) recently revamped its four year old loyalty program being offered jointly in association with Payback India (previously iMint). It also introduced a new program for its premium customers called My Trip Rewards. "We have now carved out a niche in the customer base and launched an invitation-only program for them. These premium customers will get additional payback points with MyTrip Rewards," said the MMT spokesperson. MyTrip Rewards has been in the pipeline for the past two years, but the company officially launched in on August 11 this year. In its first phase, the program is inviting customers in batches. The criteria for selection of customers for MyTrip Rewards are either the number of transactions per year (15 for Royale and 10 for Elite) or a combination of transaction value and the number of transactions made in a year. For Yatra's Elite Rewards, the selection is made by the OTA, on the basis of transactions, the company said. The program is not accessible online, unlike MyTrip Rewards, which has a separate login terminal for premium users. Yatra's Elite Rewards is still in its first phase and the company claims one lakh users have registered on it so far. Yatra has also invested in a priority desk, which tracks incoming mobile numbers and feeds them into the IVR for smoother resolution processes. "The ability to service priority customers on an all-India basis has been advantageous. With zero cancellation fees, 24 hour refunds and a no-questions-asked approach, we believe users will appreciate the service," said Mazumder. MMT has also established a separate team to offer priority service and will also offer exclusive deals as well as offers and discounts. Within premium loyalty, MMT has divvied up the program into two tiers â€“ Elite and Royale. With Royale, we have taken loyalty one step ahead by waiving off cancellation fees and offering early bird offers, says the spokesperson. Premium program memberships are valid for one year, compared to the three years for basic loyalty programs. Previously, users were only earning and redeeming on flights â€“ now they are also able to use the loyalty points for other services â€“ such as buying petrol, shopping, banking etc. MMT also plans to partner with the Future Group (Big Bazaar, Central etc.) to enable users to redeem points while shopping. Are loyalty programs by travel sites being displaced by deals? Mazumder said, "Coupons and deals are still in a nascent stage and are viewed as mass bombardment. Coupons will drive retail but not loyalty. Deals are an interesting way to acquire customers; loyalty is what will make them stay."